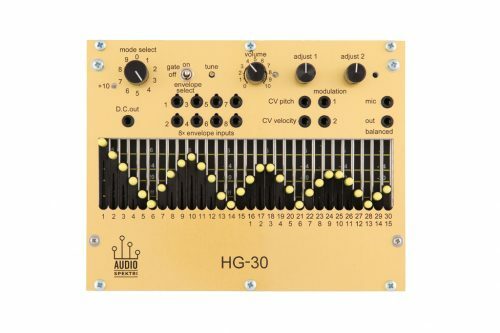 The HG-30 has two families of synthesis modes: additive harmonic generator modes with various modulation methods (PM, FM, Noise) and classical channel vocoder modes. The 30 optical potentiometers allow spectral control over a wide frequency range, and the 8 inputs for external envelope generators allow real time temporal control of the harmonics. The onboard “Virtual switchboard” connects any of the 8 envelope inputs to any of the harmonics. The vocoder modes utilize the superior digital filter characteristics over legacy analog vocoders: it has 21 linear phase channel filters, each with order of 256 for accurate spectral analysis. The synthesis section is additive for low latency response. The typical analog vocoder problem of source pitch modulation of the synthesized voice is eliminated with very steep lowpass filters. 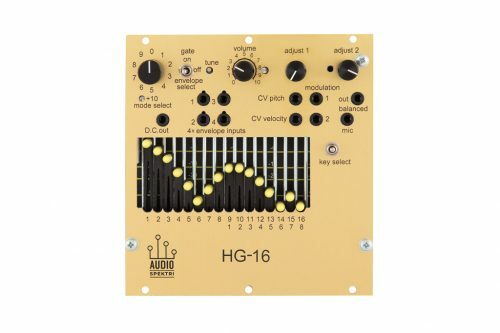 HG-16 is a lower cost version that has the same number of operating modes than HG-30. The 16 sliders limit the number of controllable harmonics in the harmonic generator modes and it has 4 envelope inputs. The vocoder modes are practically identical to the ones in HG-30. 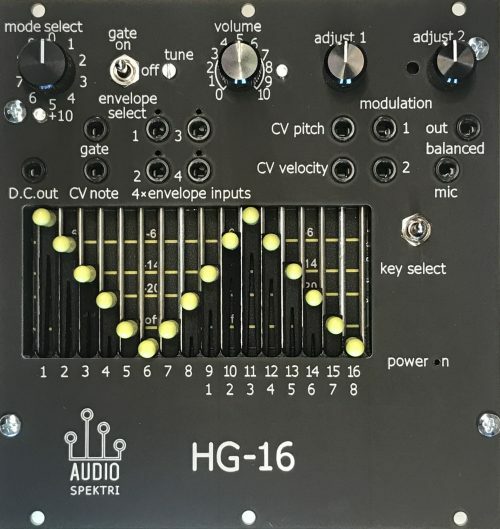 HG-16 Black is a variant for those who like to have darker modules in their Eurorack. It is slighty lower cost, compared to the gold colored HG-16, because the conventional screen printed face is lower cost than the laser patterned, anodised aluminium one of the gold variant. fed from the bus. In software they are identical.